Ukrainians celebrated the first day of visa-free access to the European Union on Sunday, with hundreds crossing the border as President Petro Poroshenko proclaimed a dramatic "breakaway" from Moscow. "The visa-free regime for Ukraine has started! Glory to Europe! Glory to Ukraine!" Poroshenko tweeted early Sunday after hundreds of Ukrainians crossed the EU border. Only those with biometric passports – containing a microchip with personal data, including fingerprints – can take advantage of visa-free travel for the time being. Late Saturday, Poroshenko addressed a crowd in Kiev's European Square, saying the new travel regime "symbolizes a final breakaway of our state from the Russian empire" and calling the future a "different historical era." 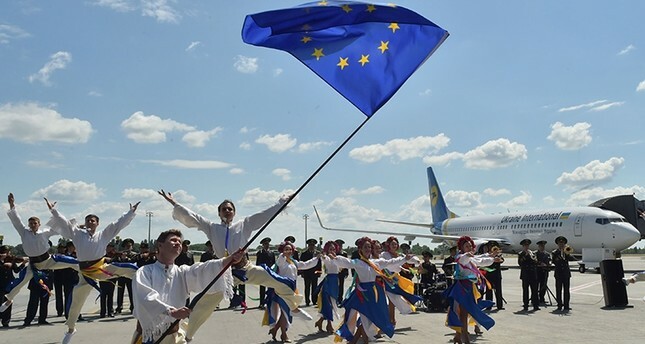 Kiev is also seeking to boost European integration with cheaper rail links and more low-cost air connections with EU cities, he said. Foreign Minister Pavlo Klimkin also cheered on Twitter after passengers on flights from Ukraine were able to enter Warsaw, Budapest, Frankfurt and other airports. "#Bezviz (no visa) is just the beginning!" he wrote. Ukraine sees visa-free travel to the EU as part of a geopolitical tussle with Russia over the ex-Soviet states' Western aspirations, which Moscow opposes. The issue of fostering closer ties with the EU was at the heart of mass street protests in Kiev that toppled a Moscow-allied president there in early 2014. Moscow responded by annexing Crimea from Kiev that March and unrest then spread to eastern Ukraine, where Russia-backed militias took up arms against Kiev government troops in a conflict that killed more than 9,500 and remains unresolved. The EU, as well as the United States, slapped sanctions on Russia over the turmoil in Ukraine. While a growing number of EU states now speak of the need to re-engage with Russia, lawmakers on Monday stressed the EU stood by Ukraine. Like Ukraine, Georgia, whose country fought a brief but bitter war with Russia in 2008, won a similar EU visa-free travel scheme this year.